After a day spent exploring the marvels of Athens, set sail in the shimmering Aegean Sea for the beautiful islands of the Cyclades. You spot the distinctive, high, green island of Kea from far away. Mountainous Kea is an excellent first stop. It is also known as the Water Island or Ydroussa for its numerous springs and streams that nourish the lush vegetation, which is something of a rarity in these parts. This has also made it a home for the water nymphs of Greek mythology. You can choose between docking at Korissia, the island's main port, located in the south end of Nikolaos Bay, opt to anchor in seclusion at the north end of the bay or choose one of the many other scenic and protected anchorages that are dotted around the coast of Kea. The grinning Lion of Kea, the most visited attraction on the island, dates from the 6th century. The story behind the huge stone lion is that the gods were resentful of Kea's beauty and sent a fierce lion onto the island to drive the nymphs away and rob the island of water. Zeus eventually restored the water supply and the nymphs returned. The island is criss-crossed with numerous hiking trails following the routes of the ancient road system that linked the villages of the island to one another. With historic sites, religious monuments and some excellent beaches, Kea is an island with plenty to offer those on a Kea yacht charter, whatever they are interested in. The island can be explored on foot, by bike or motorbike, both of which are available to rent in Korissia. There is also a bus service linking the villages of the island, including Kea Town, the islands capital. Modern day Korissia is a laid-back harbour town with plenty of shops, tavernas and bars to cater to visiting charterers. Outside the town is an acropolis - not quite on the scale of that in Athens, but still somewhere you can explore the ruins of homes and temples. Nearby Vourkari is another village with a good range of places to eat and drink. Mooring: In quiet and scenic Nikolaos Bay, you can moor at Korissia on the southern end or anchor in a number of secluded spots on the northern end. On the east coast of Kea, there is a lovely anchorage at Poleis. Dinghy dockage is available. From Serifos, it is a short passage northwest to Kithnos, another idyllic Aegean island that has a quieter and more laid-back ambience than some of the other islands that are populated with tourists. Kithnos is very much a traditional island with a warm and welcoming local population, many of whom still employ donkeys to haul their goods around the narrow streets of the island's villages. There are many authentic tavernas serving the local cuisine that has changed little in centuries - and who would want anything different? Using the freshest of the island's seasonal produce, the traditional food of Kithnos is completely delicious. Arid and rugged, the hills of the island rise to just over 1000 feet (300 meters). The coastline of the island is dotted with numerous secluded coves and bays, many of which are close to sandy beaches and make a perfect place to stop for a lazy afternoon of swimming, snorkeling and generally taking life easy on the deck of your Kithnos yacht charter. Kithnos has two principal ports - Merichas on the west coast, which serves as the island's ferry port, and Loutra, a protected harbor on the northeast coast. To the north of Merichas are the picturesque anchorages of Sandbar Bay and Episkopi Bay, both of which have lovely beaches and make for idyllic stop-overs on a Kithnos yacht charter. Stefanos Bay, south of Loutra, has a fantastic sandy beach. Inland, Kithnos has numerous gorgeous traditional villages that you can explore by scooter or rental car. Take care on the winding roads! Charming Dryopida - all whitewashed houses with painted trim that is closed to cars - is situated in a small valley and is the location of the mile-long Katafiki Cave with its underground lakes. These are sometimes open to the public and well worth exploring. Kithnos Town has a small Byzantine Museum and lots of windmills! Both villages have a good few shops and tavernas around their central squares - grab a shady spot and relax a few hours watching the world go by, albeit at a snail-like pace. Perched on the cliffs above the seaside village of Kanala, the monastery of Panagia Kanal features some wonderful murals and rewards those who brave the climb with some wonderful views. Mooring: There are no moorings but anchorages are plentiful and there is dinghy dockage. Traffic-free Hydra - not even bicycles are allowed - is the epitome of what a Greek island should be. Hydra Town is a bustling horseshoe-shaped harbor with a maze of narrow back-streets climbing up the hill behind the port. The elegant mansions that line the waterfront were built by the owners of the island's successful merchant fleet and date from the 18th century. At that time, Hydra was one of the most prosperous islands in the region, and then had a population of nearly 20,000 -- that's a staggering figure when you learn that these days it's less than 3,000. You can visit the restored Lazaro Koundouriotis mansion high above the town on its western side and see what life was like in Hydra's heyday. A preservation order restricts development throughout the entire town and serves to maintain and enhance its charm. Hydra has been fashionable since the 1950s - the legendary Leonard Cohen fell in love with Hydra. He bought and restored one of the grand waterfront houses. The many bars and cafes that line the harbourside offer a superb people-watching experience. Enjoy good restaurants further up the town. Your Hydra yacht charter allows you to explore the many coves and beaches of the north coast of Hydra. The best is at Mandhraki, but there are numerous spots along the coastline where you can anchor for an afternoon of swimming and snorkeling in crystal clear water. Kamini has a shingly beach and a couple of tavernas and Kastello is another lovely little swimming cove. Vlyhos is a small hamlet with a shingle beach where you can swim in the lee of an offshore islet. Molos, Bisti and Ayios Nikolaos are other beaches worth taking a look at - just cruise around and see which one appeals. Limnioniza is the best and most scenic cove on the south coast of the island with watersports and a small café-bar. The interior of Hydra is mountainous and little-visited, but will appeal to hikers who will enjoy the rugged landscape of isolated hilltop monasteries and pine forests. Mooring: Moor stern-to in the harbor, but be aware that space is limited and it gets crowded in high season. Crossed anchors are a seasonal fact of life. Poros is a cosmopolitan island with a host of dockside cafes and tavernas. As you approach the town you'll sail through the narrow channel that separates the island from the mainland. At its narrowest the channel is only 330 yards wide, and locals claim to remember a time when you could walk across. Poros is in fact made up of two islands - Sferia (Poros Town) and the larger Kalavria - separated by a narrow canal. The central waterfront of Poros Town is taken up with cafes, bars and souvenir shops with a few tavernas. The best are on or about the square near the town hall and the museum. The most famous night-club on the island is Poseidon, located on a hillside in Kalavria and looks down over the town. It opens at 1pm and keeps going until the wee hours - better get into training now! Heading west from Poros Town, explore the coastline of the island on your Poros yacht charter. The first worthwhile stop is the beach at Megalo Neorio with watersports facilities and a few good tavernas. Pull in to Monastiriou, one of the island's less crowded beaches, and head ashore to visit the 18th century monastery of Zoodhohou. The island's interior is pine-forested and barely inhabited, but there are magnificent panoramic views to be enjoyed by those who wish to rent scooters and explore. From Vayionia, a tiny harbor with a small beach, you can walk up to the 6th century BC Temple of Poseidon, where Demosthenes, fleeing from the Macedonians after taking part in final resistance of the Athenians, took poison rather than surrender. Mooring: Stern-to on the southern side of the port in Poros Town. Mooring: No moorings are available. 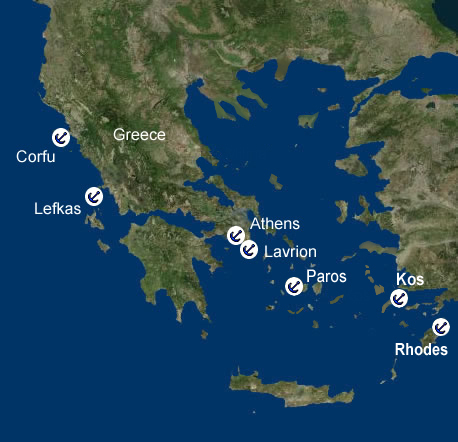 You can anchor in Cape Sounion Bay or in nearby Legrana Bay. Dinghy dockage is available. Epidavros amphitheatre was built in the 4th century BC to seat 15,000 spectators. It is still used in the summer months to stage classical dramas by Sophocles, Euripides and Aeschylus, which are performed on Friday and Saturday nights from June until the end of August. It is well worth planning ahead to book tickets for one of these performances - even if you don't understand their modern Greek script. The acoustics at Epidavros are exceptional and it is said that from the top row seats you can hear a piece of paper rustle or a coin drop way below in the orchestra pit. The theater is just one part of what was one of the most important sanctuaries - a spa, in effect - in the ancient world, dedicated to Asklepios, the god of healing and legendary son of Apollo. It is also known as a site of pilgrimage from the 6th century BC until Roman times, and is now a World Heritage site with restoration and reconstruction efforts underway. Set in a wooded valley thick with the scent of thyme and pine, the Asklepina sanctuary is as large a site as Olympia and Delphi. Visitors are able to see the ruins of hospitals, hotels and amusements built to be enjoyed by the fashionable visitors to the spa in ancient times. Palaia-Epidavros is the closest beach resort to Epidavros and an ideal place to begin exploring the wonders of the site. The town has some ruins of its own - there's a small theater which stages musical shows in the summer months and also some open Mycenean tombs. The town has a beach and a number of tavernas located around the harbor. Athens is a vibrant and modern city with an incredible historic past. You could spend a month here and only scratch the surface of what there is to see. On a short visit at either the beginning or end of your Athens yacht charter, there are a few sights that you must not miss. Number #1 on any list is, of course, the Acropolis and the Parthenon. Situated on a great rock that rises above the city, the Acropolis can - without exaggeration - be said to symbolize the birth of European civilization. You cannot visit Athens without exploring at least some of the museums on Museum Mile - start at Syntagma Square and take in perhaps The National Archaeological Museum, which houses the world's finest collection of art and sculpture from Ancient Greece and the Byzantine and Christian Museum for starters. Visit the Tower of the Winds in the Forum, the elegant Roman addition to Athens. Take a well-deserved break in one of Athens' many cafes. Then wander the narrow alleys and steep steps of Platka, a vibrant quarter with unique architecture - there's a bit of Turkish, a dash of neo-classical and a sprinkling of Greek Islands all mixed up together - before hitting the Bazaar, Athens' raucous and colorful street market, extending from Monastiraki up to the 19th century covered food hall. Stop for a drink at Thissio as the setting sun lights up the Parthenon and, if you have any energy left, head for Psyrri, the heart of trendy Athens, where the bars, cafes and restaurants keep going into the early hours. An Athens boat charter allows you to experience the very best of Athens - ancient and modern.